SG Tanks are experts in oil tank installations, serving clients in Surrey, Sussex, Hampshire and elsewhere in the South East. Backed by over 20 years’ solid industry experience, we have built an enviable reputation of being the ‘go to’ company for oil tank repairs, replacements and installations. For your ultimate convenience, our highly skilled engineers are on call 7 days a week, 24 hours a day. At SG Tanks, our specialist team has extensive experience of supplying and installing a wide range of plastic and steel oil tanks for industrial and agricultural applications as well as for private residences. We provide a complete service, with best price oil tank supply and installation, as well as comprehensive customer sales and aftersales services. We also offer professional oil tank replacement services. As a first step, we carry out an initial survey of your property or site, taking your particular requirements on board, assessing your preferred oil tank location and ensuring full OFTEC compliance of the proposed works. We then arrange for a suitable date for the repair, replacement or installation, making sure that the process is carried out with the minimum of customer inconvenience and disruption. If necessary, we will pump out and remove the old oil tank to make space for the new one. We fit fully compliant fire protection screens, whilst supplying the very best in DESO oil tanks and manufacturing our own made-to-measure steel tanks. Line pressure testing and replacement of fuel lines is all part of the service from SG Tanks, the specialists in heating oil tank installations for steel tanks, plastic tanks and industrial oil tanks. Additional services offered include fuel gauges and overfill prevention, flow meters, welded or threaded pipework, replacement of fuel lines, steel lockable cabinets, oil tank removal and much more. Installing your oil storage safely is our number one concern. That’s why at SG Tanks, we don’t just deliver the tanks, ask you to pay and then leave you to it – we support you every step of the way for all oil tanks fitted or purchased from us. We offer free estimates, 24 hour emergency callout and tanks manufactured to the highest quality like the DESO range of plastic double skinned or bunded oil tanks. You can also buy a custom steel tank made by us to order – any shape or size including 1000 litre oil tanks and 2500 litre oil tanks. Our DESO oil tanks come with a 2-year warranty while our own custom steel manufactured tanks come with a 5-year warranty. All our maintenance and oil tank removal services are available across Surrey, Hampshire and Mid Sussex. What’s more, our team of engineers is always on hand to supply boiler repair and maintenance services to any of our 200+ established customers in the local region. SG Tanks are pleased to offer FREE, no obligation site surveys and professional advice, backed up by seasoned experts with 20+ years of industry experience. Our team is always happy to provide expert guidance and advice – we offer the best service in the business. Try us – you’ll find there’s nothing we don’t know about domestic, commercial, industrial or agricultural oil tanks! Call Sean at SG Tanks today on 01903 856403 or 07976 831524 to find out more. At SG Tanks, we are always delighted to hear back from customers who appreciate our commitment to hard work and delivering service excellence. For over 20 years’ we’ve been striving to maintain our reputation as being the best supplier of oil tank installation and maintenance services in the South East. We are proud of our unrivalled level of technical skill, knowledge and expertise, as well as our passion for delivering outstanding levels of courtesy at all times. The team at SG Tanks carry out a thoroughly professional job that meets the highest standards set by OFTEC. 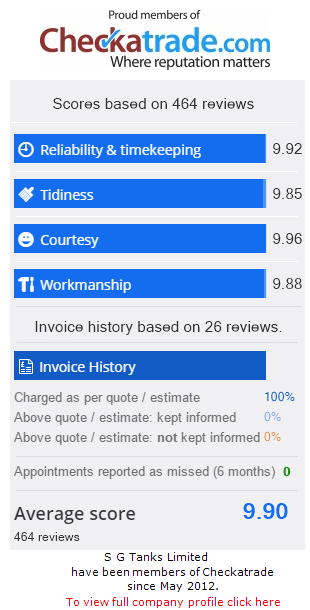 We regularly receive excellent reviews on Checkatrade and are always happy to hear feedback from our customers. For expert advice and information about SG Tanks’ oil tanks installation service, oil tank removal service and new oil tank solutions, our friendly, experienced team is here to help. Simply call 01903 856403 or fill in the form on our Contact Us page and we’ll be in touch as soon as we can. We look forward to hearing from you.